The family of a Bedfordshire man killed in a ‘single punch’ attack have raised thousands of pounds for young victims of crime in his memory. Mark Munday, 48, a father of three from Kempston, died after receiving a fatal blow during an altercation in December 2016. 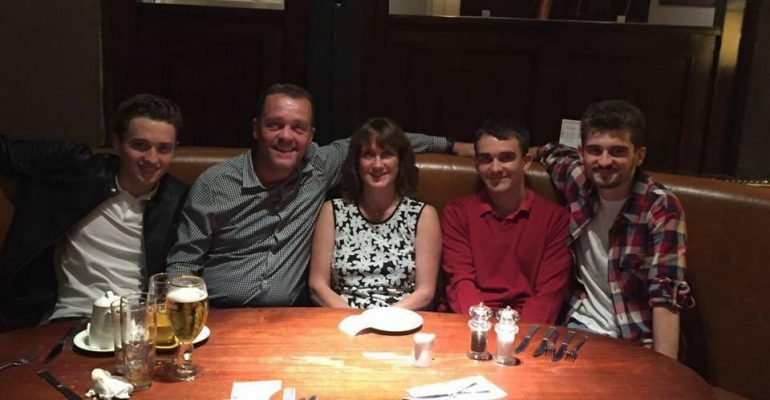 Now Mark’s family, led by wife Sandra, have raised £3,700 to help other victims of crime in their local community after hosting a charity golf day in his name. The donation will be used by children’s charity Embrace Child Victims of Crime (CvoC) to support young people experiencing trauma as a result of violence, sexual abuse and other forms of serious crime. “We held this event last year in aid of Victim Support who helped us in the wake of Mark’s death. This year we wanted to support a charity with a similar focus and we recognised the work that Embrace do in supporting the most vulnerable victims of crime. Mr Munday’s sons, Sam, Joe and Matt, were aged 23, 21, and 18, at the time of their father’s death. Mr Munday died following a single blow to the head delivered by his friend Nigel Williams following a West Ham match on 3 December 2016. Williams admitted manslaughter and was jailed for five years last April. The family have also gone on to work with Bedfordshire Police supporting the school education part of the “One Punch – Two Lives” campaign. The Mark Munday charity golf day was held at The Bedford Golf Club in Great Denham on Friday September 21, attracting 64 golfers and more than 150 people in the evening. Embrace CVoC provides emotional, practical and cheer-up support for children and young people affected by serious crime right across the UK. Since it was formed 25 years ago it has helped more than 20,000 children and their immediate families. Last year, Embrace CVOC delivered support to 86 children in Bedfordshire who had suffered crimes including sexual abuse, violence and neglect, or whose lives have been turned upside down through the violent death of a loved one. The charity has recently been commissioned by Bedfordshire Police and Crime Commissioner Kathryn Holloway to co-ordinate child victim support as part of a newly established Victim’s Hub. There, a dedicated Child Support Officer will work with victims and their families to co-ordinate help from a range of agencies that is tailored to individual needs. “Sandra and her sons have sadly suffered first-hand the trauma and the life-long consequences of serious crime.